It’s more than a year since the death of Miss Mabel Okafor Mang, a successful Zenith bank official who was reportedly murdered by her security guard on August 17, 2016. Barely two weeks at his job, 22-year-old Tanko Abdullateef, was reported to have stabbed his 50-year-old boss, Mabel, in her apartment at No J68B, Close 9, Victoria Garden City in the Lekki-Ajah area, after which he ran to his village, Bali community in Jalingo Local Government Area of Taraba State. Operatives of the Rapid Response Squad (RRS), Lagos State police command, later arrested him. Some of the assets include a fat bank account, a house at Chevron drive, Lekki, two Bureau de Change offices in Lagos and several other property. Despite the outcome of the investigation conducted by detectives attached to the State Criminal Investigation Department (SCID), Panti, the senior sister to the deceased identified as Miss Oyediya Okafor Mang wrote a petition alleging that her elder brother, Dr Nduka Okafor Mang had a hand in the death of their sister. According to earlier media reports, the body of the late bank official was discovered after she was not seen at a meeting she was to have with some top government functionaries. Calls put through to her phone lines were also not connecting. This was said to have made some people to go to her house to find out what was happening. On getting there, they noticed that water was dropping from the air conditioning panel outside. The people were said to have peeped through an opening they noticed, only to see her body lying on the floor of her living room. But the operatives of the Rapid Response Squad, who started working on Abdullateef after he committed the crime, tracked him to his village where they spent about three days before his arrest on Saturday, August 27. In some of his words after his arrest, Tanko told the police: “I can say that as this thing [killing) happened, it was the devil that got into me, because I never believed that I could kill a human being. On the day it happened, my boss returned home at almost 8.30p.m. She went to her room and later called me. “She had earlier broken some branches of overgrown flowers within the premises. She asked me whether I did not allow DISCO officials to enter her compound when they had no means of identification and I replied her that I did not. She then asked me to go and trim the flower branches. “At the time she called me, I had a knife in my hand to cut onions and pepper to prepare my dinner, and as she opened her door and gave the instruction, I just felt a spirit passed through my body. The next thing was that I stabbed her and I found her on the floor. “I stabbed her two times but I don’t really know I did it. As she fell, she looked at me and called my name repeatedly: ‘Abdul, Abdul.” I said ‘sorry Ma.’ I lifted her legs and straightened them on the floor by the three-sitter in the sitting room. I noticed blood stained her dress and the knife I used. “I pitied her as she called my name so I went to put on the air conditioner so that it would blow directly at her body. I left for her room, which I ransacked to pick some trinkets and clothes. I went back to the living room to pick her phones and N10,000 from her purse which was there. His shocking confession while at the State Criminal Investigation Department (SCID) ended the investigation while those who were initially arrested were released on bail. Tanko was charged to court and remanded in prison while his trial progresses. Bearing the heat of the crisis is Dr Nduka Okafor Mang, who claimed that the outcome of the petition by his sister led to his arrest and incarceration. Although police insist that he was arrested because he failed to produce the corpse of his late sister for further investigation. In a chat with The Sun, Dr Nduka who alleged that the police was used by his sister to tarnish his image and accuse him of murder, decided to tell his side of the story. According to him, on August 19, 2016, the pastor of his late sister called to inform him of her death. “I immediately rushed down to her house at Victoria Garden City (VGC). On getting there, I met on ground the VGC police post team and the VGC estate security team, church members and neighbors outside the house. “The pastor introduced me to the police and asked for my approval to break open the padlock key in the rear entrance of the house. My sister was found lying on the floor of her sitting room facing up with four stab wounds on her abdomen. After conducting their investigation, the VGC police team handed over to me the keys to my sister’s residence and offices and a security guard was posted to guard the premises. “The VGC police assigned a police officer with the police extract to accompany me to the mortuary. We proceeded to the mortuary and deposited my sister’s corpse and I paid the mortuary fees and was issued receipts. “On August 26, 2016, a forensic pathologist from Lagos State Teaching Hospital, Ikeja performed the autopsy and her body was embalmed. I was then issued her death certificate. The matter was later transferred to the State CID Panti, Yaba for safekeeping and I was the complainant in the matter. 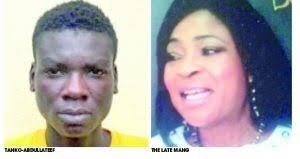 Back in Lagos, Tanko was taken to his sister’s residence in Lekki where he demonstrated how he killed her. “He also told the policemen where he hid the murder weapon and it was discovered still covered with blood stains. He told the police that he does not have an accomplice. Preparation for the burial of his sister was on-going when his sister Miss Oyediya Okafor Mang returned to Nigeria after more than 25 years abroad. “She returned in November 2016, this was after the death of our sister, autopsy and embalmment. Long before then, police had arrested Tanko and charged him to court after his confession. He further alleged that soon after the petition was written, a lot of efforts were made to transfer the suspect to Abuja, seize the corpse of their sister but failed. He and other members of the family with the help of traditional ruler of their community got an approval from the police to bury her sister. They couldn’t because the police in Abuja who claimed to have taken over the case thwarted the ceremony. His journey into police cell began on July 26, 2017 when heavily armed policemen attached to Federal SARS Adeniji Adele invaded his house seeking to arrest him. “They alleged that they acted on the instruction of DIG Dagala of Force headquarters, Abuja based on alleged petition against me by Miss Linda Oyediya Okafor Mang. Those policemen led by one Festus Olaniyi proceeded to break down the gate to my house and accessed the premises. “As soon as they entered, they manhandled my wife and two daughters twisting their arms and pushing them vigorously to the floor. My house was thoroughly searched and in the course of raiding my house called my family members murderers. “Fortunately I was not at home when they arrived but decided to honour their invitation on August 9. I reported at their office and was detained by DC Kojoe for 17 days in a cell full of suspected notorious criminals. DC Kojoe was kind enough to inform me that I was arrested based on the telephone request by DIG Dagala. On August 10, I was forced into a vehicle by heavily armed policemen led by Festus Olaniyi to the morgue on the allegation by my sister that I and my senior brother had already buried our sister’s corpse. At the morgue, Mr Festus Olaniyi and his men took series of photographs of my sister’s corpse. “On August 11, I was also forced by the same officers to my residence where a search was conducted by the same Festus Olaniyi and his men. At the end of the search , the items returned to me by State CID, Panti after the investigation was seized and these include keys to my sister’s residence and offices , Laptop, company files and other documents. The next day I was also taken to my late sister’s residence at VGC, Lekki but the estate security refused us access. He was later moved to FCID cell in Abuja for further interrogation. “ On August, 25 was again bundled into a vehicle by Sanni Fatai like a common criminal to Abuja by road not minding my age and health status. On getting to Abuja, I was detained inside Zone 10 police command cell. Days later, I was summoned to the office of DIG Dagala and as expected my sister was also there. She kept boasting in front of DIG Dagala that she spent N9million at the Force headquarters, Abuja. I was later released days later under stringent conditions. Saturday Sun was able to get a copy of the Directorate of Public Prosecution (DPP) advice dated October 27, 2017,“ which requested that Dr Nduka should be released as he had no case to answer based on the evidence presented to the court. “I am directed to acknowledge receipt of your letter with reference number CB: 3515/X/FHQ/ABJ/PDEFU/VOL.1/138 dated October 11, 2017, and the accompanying duplicate case file forwarded to the office for legal advice. “We have carefully studied the duplicate case file and it is our considered opinion based on facts contained therein that there are insufficient facts to establish a prima facie case of conspiracy to commit murder and murder contrary to section 233 of the criminal law, Cap. C17, Vol.3 of Lagos state, 2015 against Page B1(James Aikhiobare) and Page B3(Dr Nduka Mang). “The case was investigated by police at SCID Panti, Yaba, Lagos, wherein one Abdul-Lateef admitted he stabbed the deceased to death on August 17, 2016, stole some of her valuables and escaped from the scene in early hours of August 18, 2016. Page B2 (James Aikhiobare) and Page B3(Nduak Okafor Oyediya) were arrested by police from Fed SARS based on suspicion raised by Oyediya the petitioner, a sister to the deceased person. The petitioner alleged that the investigation into the murder of her sister by the Panti was compromised and was dissatisfied with the investigation hence the re opening of the case and re-investigation”, the DPP advice reads in part. On the role of the police in the crisis, Saturday Sun gathered from at the SCID, Panti, Lagos that investigation was concluded and the corpse had been released to the family when Oyediya Okafor Mang arrived the country alleging that her elder brother was behind the death of their sister. “They decided to fight themselves over the property of their late sister. The suspect was arrested and he confessed to the crime. It is a clear case, which the deceased’s elder sister, Miss Oyediya applauded initially when she returned till they could not agree on who to inherit her wealth. She was 50 years and single. She had a lot of money in bank and businesses. She also had a house in the highbrow area of Lagos. “The police in Abuja have investigated and still no new evidence was found.” Confirming Nduka’s arrest , Public Relations Officer, Federal Criminal Investigation Department(FCID), CSP Chike Nwabunwa told The Sun that detectives re-assigned to the case arrested Nduka because he attempted to obstruct investigation. “We acted based on a petition by his younger sister, one Miss Oyediya Okafor Mang. She was not satisfied with the outcome of the investigation conducted by Lagos SCID. She sought for a transfer and the matter was transferred to Force CID, Abuja. When asked why they are yet to bury the late Mabel, CSP Nwabunwa said no member of the family to his knowledge has come forward demanding for the body of their deceased sister.